When we were approached by Beverly Care to design their website it was made clear that they were looking for a warm and friendly site that would appeal to families. Throughout the design process, we worked at putting together a comfortable design that was easy to navigate and conveyed an open and welcoming air that would make visitors feel welcome. The final product is one that hits all these points while still conveying professionalism. The design was put together with an easy to navigate homepage that didn’t overwhelm the visitor with too much information all at once. Its limited use of text serves primarily as an accent to images ensuring that the patient can find what they need while maintaining a clean and streamlined design. Orange is a tricky color to use correctly as it’s ostentatious brightness often overwhelms more subtle tones in the site. Blue serves as an unexpectedly effective contrast to it and helps tame the wilder parts of oranges nature. Alongside both is the reliable and professional white that has so long been a staple of professional site design. Together these three colors are found in the BeverlyCare logo as well, keeping branding constant throughout the site. • Contrast – Blue and White are standard colors for medical sites for their reputation of portraying a sense of calm, trust, and professionalism to the viewer. Orange is a vibrant color that drives viewers to action in the same way that red does and contrasts unexpectedly well with the blue and white foundation. • Action Oriented – As mentioned above orange is an action color, and in this design, it is used as the background color for most of the button links to encourage the viewer to interact with them. It’s also used to highlight the ‘hamburger menu’ in the upper-left hand corner to ensure the viewer doesn’t miss it. Throughout the site, it is used in light brushstrokes to ensure it doesn’t overpower while remaining present enough to draw the eye to relevant information and links. This website’s design is left open and airy presenting a relaxed stroll through the information with clearly marked guides to getting the data you need. There is a careful balance to be struck with text-light sites between too little information and not overwhelming the viewer with novels of information. This site design pulls off both, ensuring the viewer feels welcomed without giving them the impression they have a novel to read. • Space – To maintain the feeling of an open and welcoming site space use had to be carefully managed, resulting in a series of distinct images used as links with a comfortable amount of space between them and a non-intrusive blue label at the bottom of each. When a block of text is presented, as in at the bottom of the page, it is done with plenty of room to breath. • Navigation – Full-page spanning menus have been shown to result in less conversion, especially when placed at the top of the page, but many visitors still profess an appreciation for them. 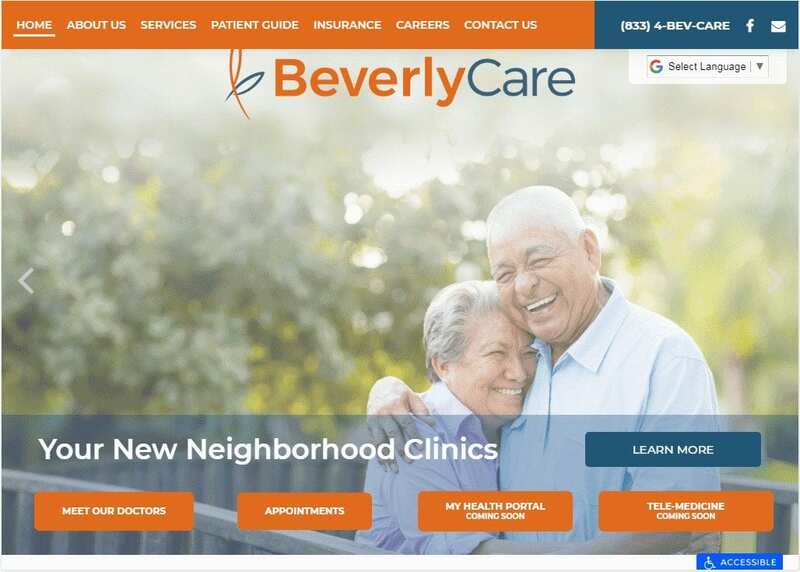 BeverlyCare walks the line by providing the hamburger menu at the upper left-hand corner of the page while also providing a page-wide menu bar in the footer. • About Us – The About Us page continues to the design principles present in the rest of the page, providing a clean white background with standard black text. Orange is used for titles and to highlight links within the text in a way that maintains the brand and personality of the site. Through this page you’ll learn about the organization’s Board of Directors, their mission, vision, and core values, ensuring you learn everything you need to know about their ideals and ambitions. • Contact Information – Contact information is subtly but clearly available as you navigate the site, starting with the phone number in the scrolling header. The menu found in the footer also contains a link to the Contact Us page, ensuring that everything you need to make an appointment is visible. This site focuses on a welcoming and low-pressure atmosphere to drive conversion, with their phone number conveniently placed at the top of the screen and the full contact information readily available through the hamburger menu in the upper left. Additionally, the site’s design makes navigation simple, a factor which has been shown to be essential to keeping potential patients engaged. This site represents a family oriented facility with a warm and open atmosphere that understands the busy life of the family-oriented individual and is dedicated to a painless visit for their patients. This is based both off of the text included and the implementation of images of hands holding heart shaped objects to indicate that your family is in good hands.